One of the many changes in the upgrade to Visual Studio 2008 is how Ctrl+Tab switches between open documents in the IDE. Ctrl+Tab used to show the previously viewed document. 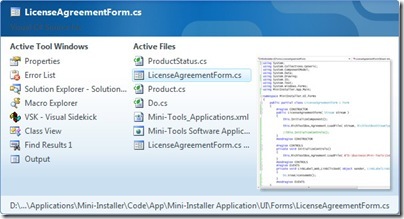 But in VS 2008, the IDE Navigator window appears as shown below, and you must press Enter to show the previous document. An additional Enter key doesn’t sound like a big inconvenience, but if you do this hundreds of times each day like most developers, you will quickly find the extra step irritating. This article describes how to disable the Ctrl+Tab navigator window in Visual Studio 2008. Microsoft has released Visual Studio 2008 and .NET Framework v3.5. These upgrades enable .NET software developers to rapidly create more secure, manageable, and reliable applications and take advantage of new features found in Windows Vista and Microsoft Office 2007. If you use images in a .NET application, chances are you will find it more convenient to embed those images as resources in your project, rather than leaving them as separate files and trying to locate and load the images from disk when the application runs. Microsoft has released a beta version of the next major release of Visual Studio and the .NET framework. Visual Studio “Orcas” will enable developers to write programs that can run on Windows Vista, Longhorn Server, Office 2007 and the Web. The .NET Framework v3.5 will provide better support for Web 2.0 and AJAX applications. Microsoft has been planning to release Orcas this year, but a corporate VP recently told ZDNet that it may not happen until 2008.